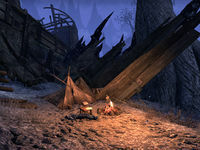 The Survivor's Camp is located east of the Reaver Citadel in northern Coldharbour. It is not easily accessible when you first arrive in Coldharbour. You must complete a number of quests before the northern gate of the Hollow City is opened up, allowing access to the northern areas. However, you can get there early by teleporting to another player at one of the northern wayshrines. This page was last modified on 16 March 2019, at 21:21.